This kind of artwork could also be listed under Experiential arts > Sculpture, since it fits there as well. I only chose this category under Decorative arts because there is a special subsection for "glass". It's a fascinating piece of perceptual design. 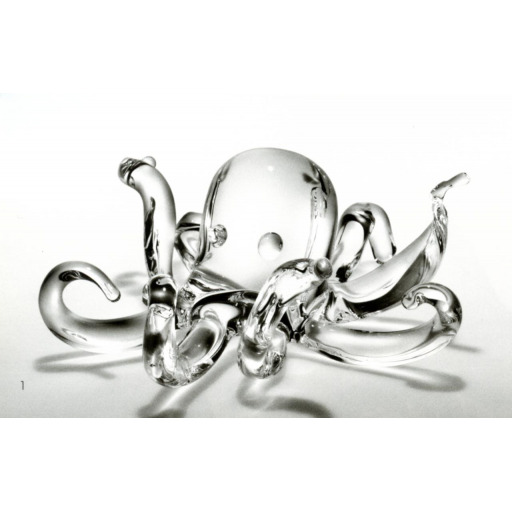 A tour de force of glass-making in the form of a complex composition of limbs and head of a classic octopus, in clear glass. created for and produced under the direction of Steuben Glass. Was seen by this author in the 2010 Steuben glass catalog and was offered at a cost of $1800. and was identified as "9045".